Budget Grip Seal Bags are ideal for sorting and storing things! Amazing special offers for you with money off a range of bags and packaging products! We have huge selection of polythene bags with over a 1000 different products to cover all you packaging needs! Polythene is generally used for producing plastic sheeting and plastic bags. Both of which come from the same manufacturing process. Polythene pellets are melted and then extruded through a circular die gap forming a plastic tube, the die can be adjusted to produce different diameters. The tube can also be made thin or thick by stretching and inflating. The tube can also be cut in one or both sides or be gusseted. The cooled polythene tube is then rolled at the end of the process. All of this is done in the same machine in a continuous flow. Polythene packaging can also be made printed with custom logos and designs. Printed packaging provides an effective marketing solution. By printing a logo, company name and/or a website address on a shopping bag will enable a company to be advertised for wherever the printed bag goes and it will also become recognizable. 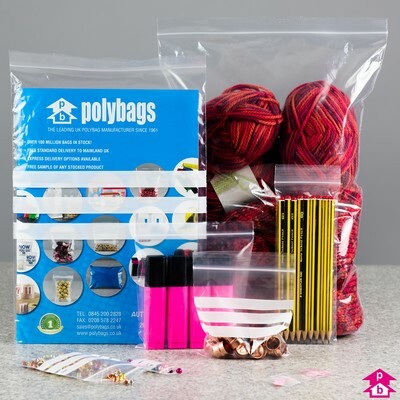 Visit Polybags if you need more information about printed polythene packaging. Clear polythene bags are manufatured in a wide range of sizes, starting from 2 inches (50mm) wide all the way up to 48 inches (1220mm). Plain polythene bags are also usually stocked with different thicknesses including the light duty 120 gauge, medium duty 250 gauge and the strong heavy duty 500 gauge. Non standard sizes and thiknesses can also be made to order. Biodegradable clear bags are also manufactured as an alternative to polythene bags. For a more demanding solution, if packing heavier loads for example, high tensile bags could be used. High tensile bags are produced with a blend of low and medium density polythene providing improved strength when compared to standard polythen bags. Polymax bags are super strong bags manufatured by Polybags. Although polimax bags are stronger than the comparable low density polythene bag they are 25% cheaper and 66% thinner. Polymax bags can offer a great deal of strength, good visibilty and better tear resistance. These are polythene self-sealing bags manufactured with 3 not glossy white write-on-panels allowing foe labeling contents with a pen or pencil. Standard polythene self seal bags are 200 gauge thick. Biodegradable compo bags are made with chemical properties that helps them to biodegrade in a compost or landfill. Once disposed in a compost heap it will usually decompose in 9 months to 2 years along with its organic waste. Slider grip bag is a self sealing bag with a plastic slider grip seal closure found in a variety of sizes. An economic solution for a professional packing look. Self-seal bags are also provided with extra bag strength 350 gauge polythene. Specimen bags are generally used by hospitals, the police and the forensics as they have the ability to carry specimens and documents on the same packaging but into separate pouches. Medical sample bags will keep the specimen safe from contamination, police bags and forensic bags will avoid the evidences from losing its properties. An antistatic bag is a shipping bag for electronic devices which can be damaged by electrostatic discharge. Static travels around the bag and dissipates before it has a chance to damage contents when shipping or storing. These plastic bags have a distinctive color (silvery for metalized Mylar and other similar plastics, pink or black for polyethylene). The polyethene bags may also take the form of foam or bubble wrap, either as sheets or bags. Get a festive 20% off Santa's favourite black sacks! There's a Christmas treat over at our parent website Polybags.co.uk, where you can get 20% off all economy black sacks (BRS120) when you spend £30 or more. That's such a fab festive discount, rumour has it that Santa himself is stocking up for Christmas night. For the rest of us, these light duty black refuse sacks are perfect for stuffing used wrapping paper into on Christmas morning or clearing up after all those fun-filled Christmas and New Year parties. To claim the offer, simply apply the voucher XMAS120 and shop away. Once your basked reaches £30 worth of black sacks the 20% discount will be applied automatically. This is a limited time offer and there is strictly one voucher per customer - that includes you Santa! 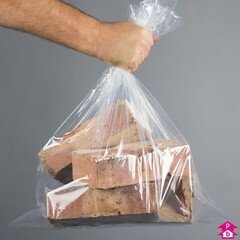 Polybag's Polymax Bags are incredibly strong, tear-resistant sacks.